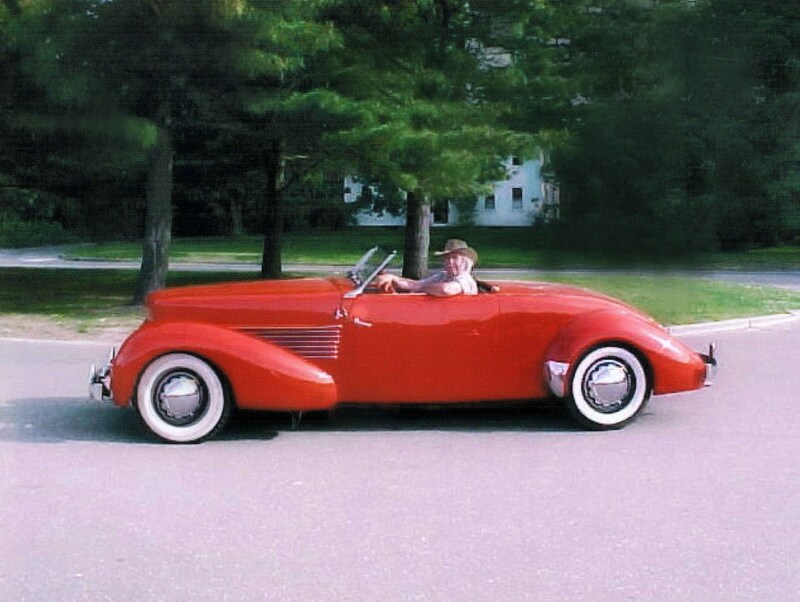 Dedicated to the classic Cord car. Back during the war about 1942-43 I was a little kid waiting for Mom who was in the store. I was sitting in Dad’s 1940 Ford Deluxe Tudor when suddenly a long, low, shiny green 4 door sedan pulled in alongside, the woman driver getting out and also going into the store. I sat and gazed at this low, beautiful car- something so different it must be out of the future! After awhile the lady returned, and noticing me looking at her car asked how I liked it. I said “It is beautiful-what is it?” She replied that it was a “CORD”. Being a chauvinist even at 5 I replied that she meant a “FORD”, not “CORD”. No she said, and asked that I get out and see, opening the driver’s door and pointing to the name “CORD” on the silvery doorsill . Pointing to each letter she then phonetically sounded them out, and combining them made the voiced word “CORD”. What a concept- letters can be sounded out and combined to make words! I wondered if anyone else knew this besides this lady! Wait ’til I tell Mom! My first Cord siting was really a big event in my little life and my introduction to the written word! I’ve talked to many Cord guys over the years telling them this story, to which they all say I have to be mistaken, that Cord never put the logo on the doorsill, but I reply vividly remember this, and I ask where else is the car’s name shown large on the car so a little kid could see it? This happened in Louisville, KY and dammit I know what I saw! I was driving my 1930 chopped and channeled Model A Ford coupe over to my job at Bud Abbots in Alton Ill. As I came over the hill in his driveway, there it was. It took my breath away. I hurried down into the shop and said, “What kind of car is that on the trailer?” Bud said, “It’s a CORD”. ‘Wow’ I said. “What year?” I asked and Bud said, “1937 Phaeton”. And it was my color — gray primer. So he took me outside and told me all about the company and how it was a front wheel drive and all the engineering feats of the car, like the supercharger, etc. However, this one had been modified by a farmer somewhere. No door handles. We used to call that shaving the handles, remember I am a Hot Rodder. The he opened the hood and there it was, an Olds rocket engine. Well back then that was the engine to have. They had taken a cutting torch and removed the center of the floor and you could see the drive shaft. Very crude but I was in love. “What are you going to do with this?”, I asked. He said “Sell it”.Now I am a guitar player playing — chords so I need this car. We made a deal and I bought it. Well there is more to the story of course. When I was eight and Carlton was 14 we moved to a new place. It had a large house and a barn and a lots of sheds just about the right size for a garage. Dad used the barn for his plumbing business but he did not need the 8 or so garages. Well, Carlton belonged to the Model A club and had lots of friends that had cars but no place to work on them. So my scheming brother started renting space! but he got caught! The sheds all had doors with a small buildup of dirt in front. One night my Dad came home with a furnace he planned on storing in one of his empty sheds! He got a shovel and discover not only was that shed full but all his sheds had cars in them! Soon all the friends and their parents were retrieving the cars. After watching and sometimes helping my brother work on his Cord I wondered why? so I asked him. And he told a story I didn’t know. He is 6 years older than I and he often got involved in things I did not know about. He used to work for a classic car guy and had the oportunity to buy a Cord while a young guy but our Father nixed the deal and he has wanted a Cord ever since! I don’t have a Cord. But my brother has a Cord. He built it hisself. And I don’t mean he just “fixed” it up. He took sheetmetal and a hammer and many hours, days, and years later he has a Cord! Welcome to your new blog! This is the first post.